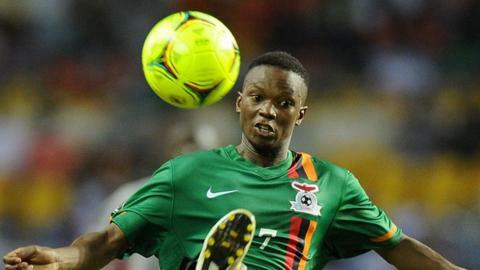 African champions Zambia will be without star midfielder Rainford Kalaba for Saturday's crucial Africa Cup of Nations qualifier in Uganda. He sustained a groin injury in TP Mazembe's goalless draw against Esperance in the African Champions League semi-final first leg. "He needs a minimum seven days to be back in training," the Congolese club's doctor, Taha Messaoud, told BBC Sport. "The injury is not too bad but he needs a lot of care. It will be very difficult for him to play by this weekend." Kalaba, whose performances for club and country have earned him a place on Caf's initial list for their African Player of the Year award, admitted he was disappointed to miss the match. Zambia carry a 1-0 advantage from the first leg as they look to defend the title in South Africa next year. "I am very disappointed because it's a crucial game for us. If we don't qualify, people back home will not understand," he said. "I just pray that the guys get a positive result in Uganda. "I believe in them and I know they will do wonders when they go there." He said he was unfazed by media reports from Uganda that the Cranes were leaving no stone unturned ahead of the match. "You can talk in the newspapers but football is played on the pitch," Kalaba warned. Zambia have set up a training camp in South Africa to prepare for the game.